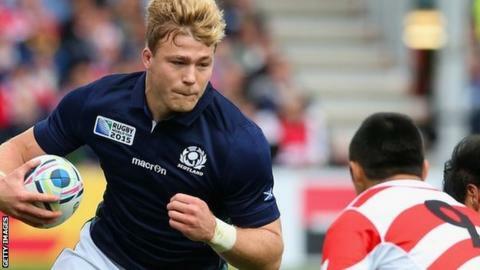 Bath have signed Scotland back-rower David Denton from Edinburgh. The arrival of Denton helps the Premiership club cover the departure of Sam Burgess, who left to return to rugby league last week. Denton, 25, has 32 Scotland caps and appeared in four World Cup games earlier this year. "We've been looking to bolster our back row for some time now so we're very excited that David is joining us," said Bath head coach Mike Ford. Born in Zimbabwe, Denton played for Eastern Province in South Africa before moving to Scotland. "He had an excellent World Cup, especially in the quarter-final when he managed to outshine one of the best Australian back rows I've seen for a long time," added Ford. "He's going to fit in very well with the team and the way we play here." Denton made 78 appearances for Edinburgh following his arrival in 2010, and can switch between blindside flanker and number eight. The back-rower, for whom Bath paid a fee to bring to The Rec, said it had been a tough decision to leave Scotland. "I've had an incredible six years at Edinburgh," he said. "It's been the hardest decision I've ever made, as I am going to miss the club, but I am really looking forward to an opportunity to play at one of the premier clubs in Europe." Scottish Rugby chief executive Mark Dodson said the move represented an "excellent opportunity" for the player to experience playing in the Premiership. "It came out of the blue, and while it wasn't an easy decision, we weren't going to stand in the way," said Dodson. "Edinburgh Rugby is well covered in the back-row department and this gives young, local talent like Jamie Ritchie, Magnus Bradbury and Hamish Watson further opportunities to play."